Marcello Leopardi was born in Potenza Picena in the Marche in about 1750 (the precise date is not recorded) and after early training there removed to Rome from 1768 until 1773. He was trained as a history and figure-painter under the instruction of Sebastiano Conca (briefly) and Stefano Pozzi in both oil and fresco in late baroque manner, and became a member of the Accademia di San Luca (the artist's guild) at an early age. He relates this training proudly in the Memoria which he wrote and which is preserved in the archive at Citta di Castello. During his early years in Rome he worked on the decorative schemes during the renovation of the Altieri Palace, though he moved regularly between Rome and Umbria (mainly Perugia and Foligno). 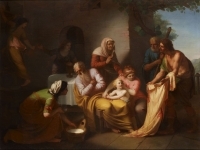 His style at this date is a synthesis of the baroque styles of the much earlier painters of the baroque, Domenichino and the Carracci, with a typical late 18th century lighter palette.. From 1781-86 he worked intermittently on a large canvas for the Oratory of the Confraternity of Justice (1781-6) whilst also working in the Duomo in Peruguia on the frescoes for the lateral nave (1782-89). His secular work in Perugia and Foligno included large frescoes and decorative schemes for Camera di Intrattenimento (1785) and such private palazzi as the Rossi-Scotti, Conestabile della Staffa, and the Palazzo Ranieri in Perugia, and the Palazzi Lezi-Marchetti and Alleori-Ubaldi in Foligno. Apart from the latter, his Foligno works are mainly of a mythological rather than religious nature, and lead directly to his interest in, and adoption of, neo-classicism.. In about 1790 he came under the pervasive influence of Roman neo-classicism, which he took up wholeheartedly. He returned to Rome to work from 1793 to 1794, where his work was heavily influenced by Angelika Kauffman, who had returned to Rome to stay in January 1785. His work is sometimes erroneously attributed to her. Leopardi died shortly after his return to Perugia in 1795, where his last work was again religious in theme: the decoration of the Chapel of the Sacraments in the Duomo. Although a leading exponent of Roman neo-classicism, he took his exemplars from the earlier Roman baroque painters and, amongst his contemporaries, Angelika Kauffman, and was much less influenced by the fashionable, but drier, academic French neo-classism. Genesis 37 etc. Jacob makes “a coat of many colours” (according to the King James bible: many other translations are equally plausible) for his favourite son, Joseph, the child of his old age. His older brothers are jealous of the young man and plot his downfall. Joseph's jealous brothers lead by Judah sell him to some Ishmaelites and show Jacob the coat, dipped in goat's blood, as proof that Joseph is dead, having been eaten by wild animals. This is the scene depicted in he present painting. Meanwhile the Midianites sell Joseph to Potiphar the captain of Pharaoh's guard, but Potiphar's wife, unable to seduce Joseph, accuses him falsely, and he is cast into prison. Here he correctly interprets the dreams of two of his fellow prisoners, the king's butler and baker. Joseph next interprets the dream of Pharaoh, of seven fat cattle and seven lean cattle, as meaning seven years of plenty followed by seven years of famine, and advises Pharaoh to store grain during the good years. He is appointed second in the kingdom, and, in the ensuing famine, "all the earth came to Egypt to Joseph to buy grain, because the famine was severe over all the earth." Jacob sends his sons to Egypt to buy grain. The brothers appear before Joseph, who recognizes them but does not reveal himself. After having proved them on this and on a second journey, and they having shown themselves so fearful and penitent that Judah even offers himself as a slave, Joseph reveals his identity, forgives his brothers the wrong they did him, and he promises to settle in Egypt both them and his father. Jacob brings his whole family to Egypt, where Pharaoh assigns to them the land of Goshen. Jacob receives Joseph's sons Ephraim and Manasseh among his own sons, then calls his sons to his bedside and reveals their future to them. Jacob dies and is interred in the family tomb at Machpelah (Hebron). Joseph lives to see his great-grandchildren, and on his death-bed he exhorts his brethren, if God should remember them and lead them out of the country, to take his bones with them. The book ends with Joseph's remains being "put in a coffin in Egypt."